The scourge of pre-peeled, pre-packaged produce and subsequent internet outrage has become a recurring part of modern life. Remember The Great $6 Asparagus Water Incident of 2015? Well, Whole Foods refuses to back down from its privileged perch. 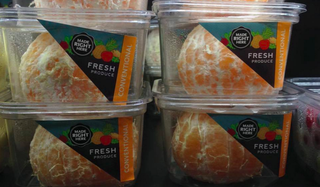 Earlier this week, the market dared to place pre-peeled oranges on shelves frequented by social media users. The indignity suffered by these naked oranges (tangerines, actually) was first posted by Michelle Cehn from World of Vegan on her Facebook page, launching the latest pre-peeled, pre-packaged outrage anew. After this tweet had circulated the globe several times, Whole Foods made a baffling move. It apologized! A lot of our customers love the convenience of our cut produce offerings, but this was a simple case where a handful of stores experimented with a seasonal product spotlight that wasn’t fully thought through. We’re glad some customers pointed it out so we could take a closer look. A closer look might reveal a cornucopia of fruits on the very same shelf: oranges not only peeled but sliced by this steady unseen hand, meticulously arranged in even larger plastic containers, each awaiting their turn to be shuffled into reusable organic cotton tote bags alongside dozens of other responsibly sourced plastic-wrapped foods and driven in fossil fuel-consuming vehicles to their new Instacart-user homes. Update: The photo was originally taken by Michelle Cehn / WorldofVegan.com and the post has been updated.